AMERICAN-ISRAELI NASCAR TEAM TRYING FOR SPOT IN DAYTONA 500…….. – The Tundra Tabloids……. 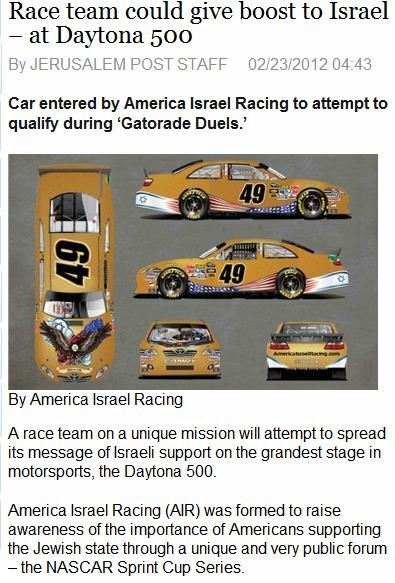 AMERICAN-ISRAELI NASCAR TEAM TRYING FOR SPOT IN DAYTONA 500…….. In order to earn a spot in Sunday’s Daytona 500, the America Israel Racing No. 49 Toyota will have to race its way in during the Gatorade Duel 150s, which takes place on Thursday in Daytona Beach, Florida. The car, driven by J.J. Yeley, will participate in the second duel. Both races will be televised by SPEED. “This is a critical time in our nation’s history as it pertains to our relationship with Israel,” said Rich Shirey, cofounder of AIR. To help achieve its goals, AIR teamed with NASCAR veteran Jay Robinson of Robinson-Blakeney Racing to attempt to place a car in this year’s Daytona field. Next Post Next Post SHOCK: TUNISIA AND EGYPTIAN ISLAMIC FUNDAMENTALISTS SAY ISLAM TO PLAY BIGGER ROLE IN SOCIETY……. JJ Yeley hasn’t had a lot of luck (or lavish sponsorship) in Sprint Cup racing. However, he’s a good driver and has had some success in the Nationwide series. The manner in which the Daytona 500 field is set is rather complicated and unique. The top 36 in last year’s points are guaranteed a starting spot. That leaves just 7 spots available; some of which can be taken as provisional by past champions. JJ Yeley and American Israel Racing have to race their way into the Daytona 500 during the 2nd 150 mile duel race today. Racing into the Daytona 500 is the hardest way to make the race. It will be an accomplishment of itself for Yeley to make the starting field of the Daytona 500. That being said, last year’s race was won by the Wood Brothers team which is an old established, yet distinctly underfunded team. There ARE “Cinderella Stories” in the Daytona 500 and if Yeley makes the race, dodges the big wrecks and has fuel at the end to run three green-white-checker overtime finishes, he could end up making a big impact. Stranger things have happened before. It’s all a long shot but with new fans and a little help from the Creator (B”H), Yeley and American Israel Racing should at least be around in June for the 400 mile race at Michigan International Speedway. FYI, the team has a facebook page. They are also taking donations. I gave them an $18 donation as a gesture of support. I hope to see the American Israel Racing team at Michigan International Speedway this June when the top 36 spots from the previous year are no longer locked into the starting lineup.